This Advent we’ve been paying attention to Mary, and her journey of understanding and embracing the way God plans to use her life as she becomes the mother of Jesus. God’s messenger Gabriel comes to visit her, and she listens carefully and deeply to what he has to say to her. Mary says, “yes” to God’s invitation because she trusts that what seems is impossible is possible with God. In the meantime, her cousin Elizabeth is expecting a child as well. Her husband Zechariah also has a visit from the angel Gabriel, and they, too learn that something impossible will come to pass. In their old age, they will have a son and he will be God’s prophet. Scripture tells us when Gabriel comes to Mary, Elizabeth is already six months pregnant. This is the season of Christmas letters. I love hearing from people, catching up on what’s going on. But then there are Those Letters. You know the kind. Everyone is always doing fabulously. Midge took her whole family, all 18 of them, on a European cruise where everyone got along famously – one big happy family. Henry and Jackie’s daughter got the lead in the school musical and now has her first CD out; their son is the star quarterback and is being recruited by Ohio State and a host of other schools, and of course, they’re both on the honor roll. Charlie and Marge’s daughter is the new CEO of some Fortune 500 company, and their son is teaching at Harvard Medical School and just discovered the cure for cancer. There was a time I hated those Christmas letters. My life didn’t look anything like that – my life was messy and complicated. Honestly, those letters struck a nerve. I was jealous of those perfect families. I come by that jealousy honestly. I was raised in a family where a certain kind of success mattered, mostly academic, and you knew where you stood. My 93-year-old father can still tell you the SAT scores of my brother and Mike is now 65 years old. My other two brothers were both valedictorians in High School and won all kinds of awards. I grew up feeling like the slacker in the family. Even my identical twin sister was more successful than I was. She still is, by most measures of success. Even her daughter seems to outshine her cousins. Annie graduated from High School at age 16, and from University of Chicago at 19. In High School she won an art contest for the Chicago Ravinia Concert series; out of thousands of entries, hers was picked for their posters and banners that year. She was a Deacon in High School and after college went to South Korea to be a Volunteer in Mission. Chris and John could easily write one of ‘Those” Christmas letters if they wanted to. To be honest, I’m still jealous sometimes. Something that hard-wired doesn’t go away with age. In vulnerable moments, even hard-won wisdom gets swamped. What I know now is that I’m not alone. When the world measures you by net worth, SATs, or titles, it’s hard not to get jealous of people who seem to have it all. Especially if there are struggles in your own life. Which is why I love the cartoon on the front of our bulletin this morning. Mary has the ultimate bumper sticker. Just imagine her Christmas letters: ‘My son turned water into wine, walked on water, and raised someone from the dead.’ Top that! 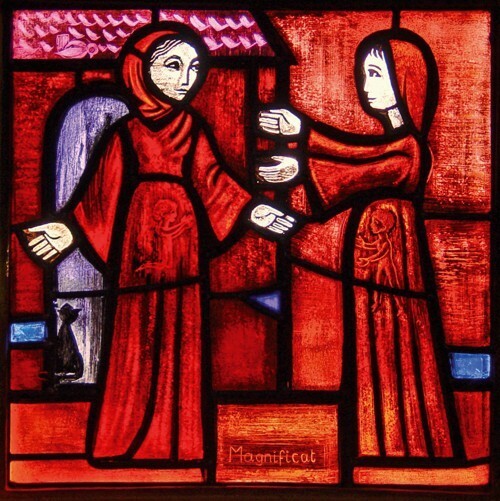 Which brings us back to our scripture this morning, when Mary visits Elizabeth. Just imagine what the competition could be between the two of them. But there’s not a shred of it there. Elizabeth’s child will be John the Baptist, and Mary’s child will be Jesus the Messiah. It’s clear that John is subordinate to Jesus. He comes to prepare the way for the Messiah, but he is not the Messiah. Elizabeth knows this from the start. And she accepts this gladly. She feels honored to be visited by Mary. Her child even leaps in her womb. There’s no sign of jealousy – only joy. Now, you could argue that these are pretty holy people, and God knew well enough to pick well-adjusted adults to raise these special kids. God would never pick hot messes like me. And you’d probably be right. But there’s something more going on in this story – or rather behind this story. To understand it, bear with me as I fill in some history. First off, a lot of people have wondered why John the Baptist gets so much airtime in the Gospels. It’s kind of curious, isn’t it? He’s there at the beginning of all four Gospels, and then nobody talks about him any more. They all make a point of showing how John is the forerunner of Jesus, and even baptizes Jesus, but when Jesus begins his ministry, John is barely mentioned. You could easily tell the story of Jesus without John. So what’s going on? Well, apparently John was a very important person in his own right. Both he and Jesus each had their own set of disciples. They were competitors, each doing their own preaching and teaching like other prophets were doing in those days. John had his own disciples long after Jesus was on the scene. In fact, there is still a small minority religion in Iran – the Mandaeans – who believe that both Jesus and John the Baptist were important prophets, but that John was superior to Jesus. It’s as if the Gospel writers had to make the case that Jesus was more important than John. While John was an important prophet, Jesus far exceeded him in impact, power, and identity. Luke goes farther than any of the other Gospel-writers, tracing the difference between them all the way back to their conceptions and births. John might be on the honor roll, but Jesus is the Son of God. Which brings us back to Elizabeth and Mary. This is what’s so crazy: Even John’s own mother is willing to admit that Mary’s son is more special than hers. She not only admits it, she celebrates it. There is no jealousy. Just joy. So what are we to make of it? I think they have a really important lesson for us. Because here’s what’s happens between Mary and Elizabeth. These two mothers aren’t competing through their children. Instead, they’re looking at what God is doing – in their own lives, in each other’s lives, in their children’s lives. And that’s the joy and wonder they’re more than ready to share. That’s why Mary runs to her cousin’s house. That’s why Elizabeth is delighted to see her. They want and need each other, as they try to understand what God is up to here. It really does make me wonder… whether Elizabeth and Mary are showing us the antidote to jealousy. Simply asking what God is up to in another person’s life. Simply being curious what God is up to in our own. I remember a Christmas letter I received several years ago. It was from a friend of mine in seminary. She was married to a wonderful man who had a wonderful job that fit him perfectly. She was happily staying home to raise their two children, who were incredibly successful in school, in sports, and in the arts. Both were headed for Ivy League schools. A photo showed their family backpacking together somewhere glorious, everyone beaming. Their lives sounded like a dream, while mine at the time was falling apart. Jealousy reared its ugly, ugly head. A few years later I got to see my friend again. It had been years since we’d been together, and I really was delighted to see her. We had a good visit, diving deeply into the stuff of each other’s lives. That’s when I learned what was behind that letter. It turns out she had been struggling with depression, major depression. It took a long, long time for her to heal. In the meantime, the one thing she knew how to do was to give thanks for what was going right. Her letter wasn’t a brag-and-boast, it was her best effort to focus on God’s grace when so much inside was crumbling. What happened that day was like Elizabeth and Mary. Jealousy had no place. The only thing that mattered was how we helped each other. In our speaking and in our listening, we could help each other see God’s presence, how God was working in our lives. There were no messengers from God like Gabriel – we only had each other. But I can tell you this: we both felt honored, and we both felt blessed, and above all, we felt joy. I don’t know where you are in this season, how your life is shaping up, what your Christmas letter would look like. Maybe you have things to celebrate, and you want to run to share the good news with other people. Or maybe your life, like mine, has had some challenges. In our work as pastors, we get to hear more than most people what’s beneath the surface, and I know that all of us have burdens that keep us up at night from time to time. Things like cancer, or budget shortfalls at work, or a marriage that is crumbling or children who are struggling. That’s when we need each other most. Wherever our lives are this season, let’s take some wisdom from Elizabeth and Mary. Let us rejoice with those who rejoice, and weep with those who weep. Above all, let’s help each other search to see what God is doing here and now, in your life and in mine.